Taste Monkey is a new site that will help you select wines that fit your personal tastes. What do they do? Think ‘Netflix ratings’ for wines. 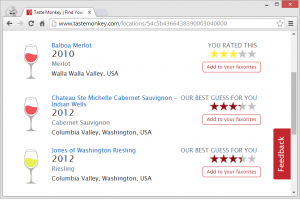 With Taste Monkey, you can rate wines you’ve tried, out of 5 stars. The more wines you rate, the more familiar Taste Monkey becomes with your personal tastes. For wines you haven’t tried, the more accurate the personalized ‘best guesses’ will be. Taste Monkey will also remember the wines you’ve rated, for easy future reference and you can optionally enter in tasting notes and share with your Facebook friends. 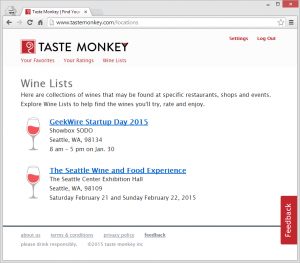 The Seattle Wine and Food Experience is a great place to start using Taste Monkey. Sign-up (it’s free) and click on the ‘Wine Lists’ link to see a list of wines available from the wineries at the event. As you taste wines, rate them and Taste Monkey and it will start to give you best guesses for the other wines available. Use these guesses to help pick the most enjoyable wines (for you) throughout the day! Visit Taste Monkey at booth number 415 (inside the Tim’s Cascade Beer & Cider Exhibit) to meet one of the three co-founders who will be on hand to greet you and to talk about wine and technology. Base in Redmond, WA, Taste Monkey is the garage project of three guys who build software by day and enjoy wine (re: algorithms) by night. For general inquiries and information about partnerships and investment opportunities, please email tastemonkeyinc@gmail.com.